If we cannot imagine another way to live with floods, then we had better hope that the last three years are a total anomaly and that we will not soon see another storm like Harvey. On the other hand, if we think that Harvey would make a better benchmark for planning than the FEMA-defined 100-year floodplain, as some of our best minds do, then we need to radically reimagine how we coexist with big floods. Yes—coexist! We are not going to control Memorial Day floods, Tax Day floods, much less Harvey floods. Floods like these occurred long before the first street was paved in Houston and long before development started to eat up the Katy Prairie. There is not much we can do to limit this kind of flooding. I am one who speaks for wetlands and prairies all the time-so don’t get me wrong. Whatever storage capacity they have is completely overwhelmed by a Harvey—or by a Memorial Day storm for that matter. That doesn’t mean we don’t need to preserve these areas—we absolutely do. Natural areas do reduce downstream flooding very significantly under lesser rainfalls, but more importantly, they ensure that there is a sustained high-quality freshwater inflow into the Bay. Not only natural wetlands are overwhelmed—our entire drainage system of detention ponds and improved conveyance that is engineered to the 100-year storm is also overwhelmed during very large storms. And no amount of “low-impact-development” practices such as green roofs or bioswales is going to have much of an impact during a Harvey. These practices are still worthwhile—like wetlands, they clean stormwater runoff. We are left with the features that have the largest volume and conveyance capacity—our natural floodplains. Floodplains are our very best and perhaps only real defense against another Harvey. We have just one little problem though. 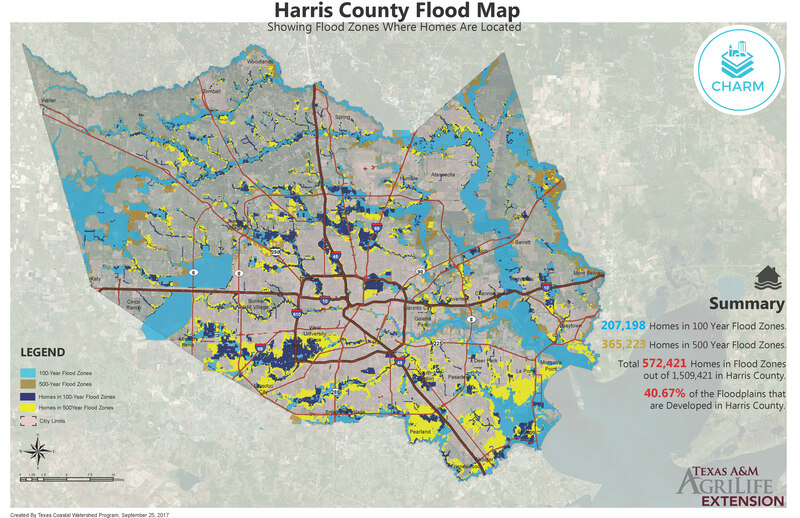 A recent analysis conducted by Texas A&M AgriLife Extension’s Texas Coastal Watershed Program found that over 40 percent of the FEMA-defined floodplains (100 and 500 yr) in Harris County have been developed, and within Beltway 8 more than 60% have been developed. Over 200,000 homes are in the Harris County 100-year floodplain. That represents incredibly diminished floodwater capacity, not to mention way too many people that are going to require boat and helicopter rescues during the next Harvey, or even a Tax Day flood. We now know that our recent flooding in many cases was not limited to the FEMA floodplains. We need to restudy and redraw these lines to better reflect the larger storms that will, by most accounts, continue to come our way. Is there enough capacity within the natural or geomorphic floodplains to handle a Harvey storm? We need some serious research modeling to answer that question with any precision. But given that most places did NOT flood, then clearly the capacity exists to move Harvey-sized floods through our area without people getting flooded. We are just going to have to recognize that we are indeed the Bayou City, and that bayous AND their floodplains are part and parcel of who we are. Floodplains flood. We need to remember that. We can indeed learn to live with floods. Bad decisions, then, got us to where we are today, unable to absorb a Harvey-sized flood. There is plenty of blame to go around, and perhaps some fingers should be pointed, but we really need to be looking forward. If bad decisions got us here, then good ones can get us to a better place. The Bayou City can be a great city, one that lives up to its name. Bayous have to flood—it’s what they do. Bayous need wide and beautiful floodplains. Wide floodplains could be key amenities for the Bayou City. Natural areas could be restored, but we could also engender an unprecedented park renaissance for the entire metro area and beyond. All kinds of flood-proof parks and civic spaces could replace the bought-out houses. This will not come cheap. If we start by buying out at least 50,000 homes, at $200,000 each that adds up to $10 billion dollars. On August 25th, such a proposal would have been laughed at. Now we know it is simply a down payment for a stable and resilient future. This is an expense that has to come from our taxes, but building replacement homes is also an economic stimulus that will pay resiliency dividends. This will be the work of decades, not just a few years. Many wonderful neighborhoods that contribute to the lifeblood of the city will be serious candidates for buyouts. It will be painful. Not everyone even in neighborhoods subject to repeated flooding are going to want to leave. People with resources will spend money to elevate their houses. At $200,000 per house to elevate, this option is not going to be available to the many thousands of homeowners whose entire house value is a fraction of that. We are not going to be able to reclaim all of the floodplains all at once, and some not at all. But if we are going to get to a point where most of Houston is no longer in harm’s way during a Harvey-type storm, or even a more tightly focused storm like Allison or the Tax Day floods, then we need to make flood plain reclamation the keystone of any long term drainage plan for the city. This is the green infrastructure that will make a difference. We will need a clear vision that we can indeed prevent another Harvey –the impacts, not the flooding. But we can’t get there the same way we got here. Our leaders need to rise to the occasion. Hopefully before the bayous rise again.